We process all bakery orders quickly and safely deliver each package with freshness in mind based on of your preferred shipping method. A: We ship our bakery products using FedEx Ground/Home Delivery and FedEx Express. We are not able to ship to PO Boxes, APO, FPO, and DPO. A: Orders placed before 11 p.m. Central (Monday through Tuesday, excluding holidays) are generally shipped the next business day. Orders placed after 11 p.m. Central (Tuesday through Sunday, excluding holidays) are generally shipped the next full week, based on your selected shipping option. You will be notified by an email containing tracking information once your order is picked up. Q: How is my order shipped, and what do I do when it arrives? A: Our bakery products are baked, then shipped fresh frozen to help maintain the maximum freshness and stability possible. Your order is pulled, gently packed with shredded paper in a sturdy corrugated box with our bakery name on the side, labeled and swiftly sent on to its new destination. We do apologize for the messiness of the shredded paper, but we strongly believe in recycling and care of the earth so hope you understand this process. Please be advised that we use no added preservatives in our bakery products. We do recommend that upon arrival of your order, you should refrigerate/freeze immediately to maintain maximum freshness for a longer period of time. When stored properly, you will be able to keep your items for many months. Q: How long will it take to arrive once shipped? 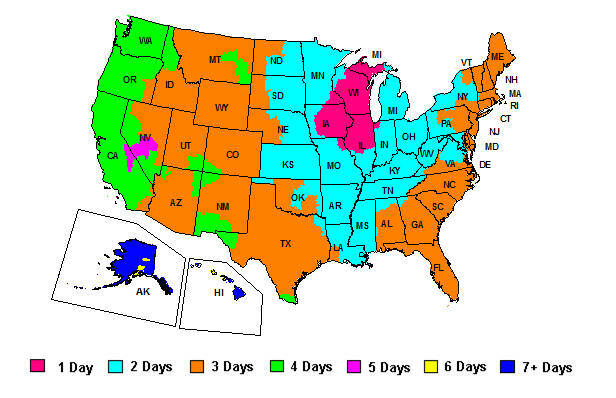 A: Please view the map below to determine how many days it could take for your order to arrive. This FedEx map illustrates service schedules on business days (as of May 2017) for FedEx Ground shipments. To ensure the best quality, customers may want to select faster shipping methods, which tend to be more expensive. Q: Can I pick up an order and not have it shipped? A: Yes, customers can pick up bakery orders at Sinsinawa Mound. The “Pick-up” option is located on the checkout page under the shipping options. Please be sure to type in the pick-up date in the designated area on the checkout page. We do require a 24-hour notice for all orders requesting pick-up for the next day. Orders needing to be picked up Saturdays, Sundays, or Mondays need to be placed by noon (Central) on Friday. Orders placed after noon will not be checked until Monday due to being closed on weekends. For your convenience, your order will be available for pick-up anytime between noon and 8 p.m. (Central) at the Sinsinawa Mound main entrance. The shipping policy can be found by clicking here. Sinsinawa Bakery requires at least one (1) business day notice to cancel an order. A full refund will be given and refunded to the credit card used. NO CASH REFUNDS WILL BE GIVEN. Failure to receive notice for cancellation will result in forfeit for a complete refund and product that is not picked up at the day and time the customer selected will not be refunded. Q: What is the allergen information? All Sinsinawa Bakery products are manufactured in a facility that processes other products which may contain soy, dairy, wheat, tree nuts, peanuts, and eggs. The bakery currently does not offer gluten free products. Sinsinawa is not responsible for allergic reactions to products.